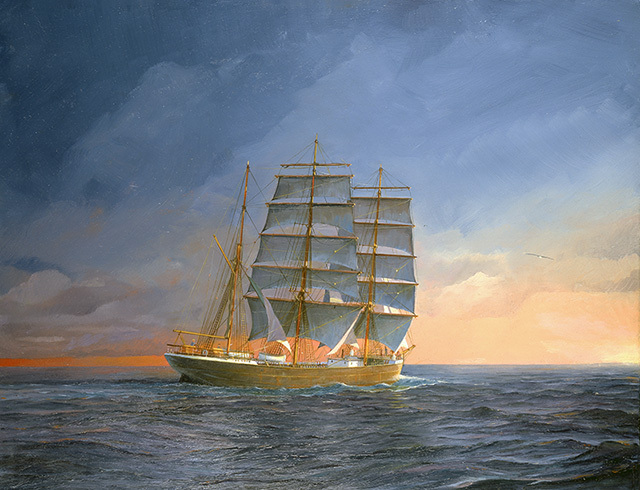 Ships sailing from Europe to Australia always travelled east to make best use of the prevailing winds. However, when working down through the Atlantic, the need to seek out fair winds meant that the sailer had some westing in its course, which took her over towards the coast of South America. 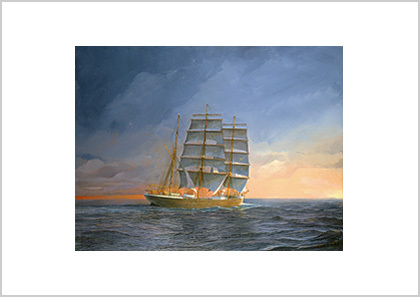 Once in the globe encircling westerlies of southern latitudes, the sailing ship could travel thousands of miles in fast time. On leaving Australia or New Zealand the sailer headed east again to return to Europe by way of Cape Horn. Penang was bought by Finnish shipowner Gustaf Erikson from the Laeisz Company in 1923, from which time she was used increasingly in the grain trade with Australia. In 1941 she was torpedoed by the German U-boat, U140, with the loss of all hands. Penang is depicted here prior to 1933, when she inherited the steel charthouse from the four masted barque Hougomont after that vessel was dismasted in the Great Australian Bight on her way to Spencer Gulf.